Having the right kind of entry doors on your home can have a serious impact – both on aesthetics and functionality. The color, style and material you choose should complement your home by giving it a classic, modern or contemporary flair. An entry door is more than just the entryway to a house, it also serves as protection from the elements. A poorly installed door may allow air to escape, directly impacting electricity and heating bills. It can also let moisture in, inviting further property damage. For entry doors and double doors that are properly installed, contact the folks at Gerald Jones. We are a local business that has been hard at work for over 60 years, installing high quality doors for homeowners across the Raleigh-Durham area. With the help of trustworthy manufacturers like ProVia, we are able to provide the best entrance door products on the market. They come in a variety of different styles, from traditional to contemporary. Fiberglass doors, steel doors, wood doors and more are available for installation, and each come with their own benefits. Steel doors, for example, are sturdy and luxurious, while wood doors have a certain rich look and fiberglass doors are the most timeless of all. 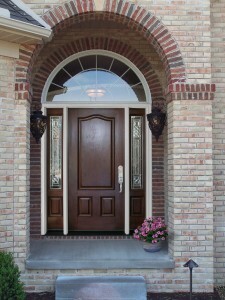 With Gerald Jones, you also have the ability to custom order your entry door to create a unique design. 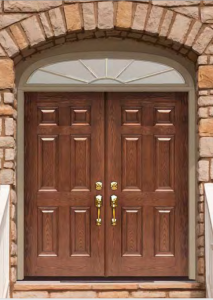 For more information about our selection of entry doors, click here. Whether you want a single, classic entry door or an elaborate double door, Gerald Jones is here to help. We can assist in finding a unique solution that represents your home’s style and personality. Depending on the architecture of the home, we are typically able to process design requests in a quick manner, making this a hassle-free upgrade that will do wonders for your home in the long run.